Indian Equity Markets had a relatively stable and steady session. The benchmark NIFTY enjoyed a positive opening as the session progressed; the NIFTY steadied further and ended the day with a gain of 91.55 points or 0.87%. Technically important thing to note was that the NIFTY managed to open and move past beyond 10500-mark. Therefore, these levels of 10480-10500 zone will act as support area for the immediate short term. Going to trade on Tuesday, we can expect a quiet start to the Markets. While we approach the 50-DMA mark of 10617, we expect some minor consolidation to happen. Tomorrow’s opening would be crucial it will be important to see if we still keep inching higher or consolidate once again with the level of 10617 acting as resistance. Tuesday’s trade will see the levels of 10615 and 10650 acting as likely resistance area for the Markets. Supports will come in at 10550 and 10490 mark. The Relative Strength Index – RSI on the Daily Chart is 50.2279 and it has marked a fresh 14-period high which is bullish. Daily MACD is sharply moving towards positive crossover and we may see this happening in coming days. On the Candles, a rising window occurred. This is usually a gap and often results into continuation of up move. While having a look at pattern analysis, it is observed that NIFTY has defended and re-validated support of 100-DMA at close levels. Also, it is likely to resist to 50-DMA which stand at 10617. 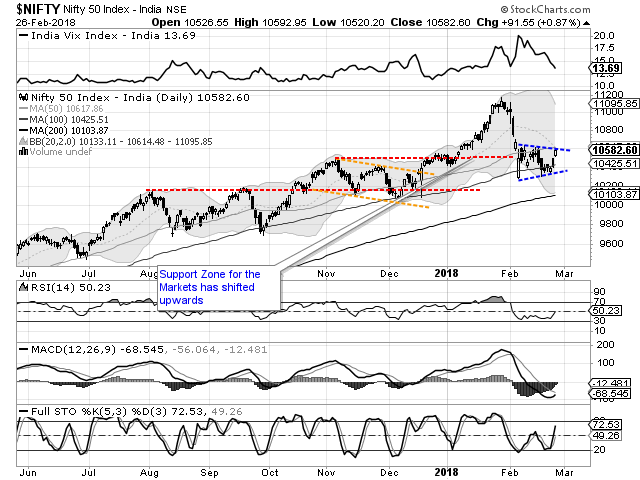 However, over previous days, NIFTY has formed a small congestion zone. 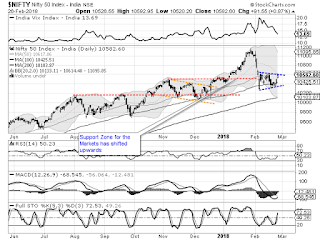 Overall, though some consolidation is likely, but in all probabilities NIFTY has formed a base in the support area zone of 10276-10300 and is likely to inch higher from current levels. The congestion zone that is seen looks like an accumulation. It is likely that post some minor consolidation, if any, we will see the NIFTY inching higher, moving out of this congestion area. This will result into confirmation of the current support levels. We recommend approaching the Markets with a highly stock specific view and maintain a cautiously positive view on the Markets for the day. Fresh long positions were seen being created in RCOM, TV18 BROADCAST, IDEA, JSW STEEL, SOUTH BANK, RNAVAL, ASHOK LEYLAND, MOTHERSON SUMI, HDIL, HIND ZINC and L&TFH.